Chris, Leianne, and Jonathan Lea are our generous farming family that will be growing the crop for the Anglican Grow Hope project in Manitoba. They have donated fifteen acres of their farmland to Grow Hope. When you sponsor one of fifteen acres of the Grow Hope project, the proceeds help end hunger. The organizing committee is hoping for enough donations to cover the cost of planting and harvesting 15 acres. The cost to raise an acre of wheat is approximately $300. When the wheat is sold, the Lea family is expecting to sell the crop for anywhere from $400 to $450 per acre. The Lea family is not only donating the farmland, they are donating their time, equipment, and talent to plant, raise, and harvest the crop. 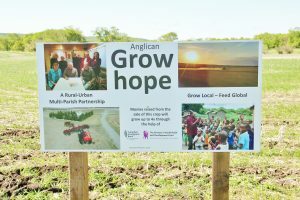 The Anglican Grow Hope project is developed in partnership with the Canadian Foodgrains Bank and its member, the Primate’s World Relief and Development Fund. Follow along on Facebook for updates on this Grow Hope Project. From spring thaw, to preparing the soil, planting the crop, fertilizing and tending the crop, ultimately to harvesting the crop, there will be pictorial and descriptive updates throughout the upcoming months. Thank you to the Lea family for donating fifteen acres of farmland for this project, and for donating their time, talent, equipment, and so much more to grow the crop.